"LIVING the DASH'' 1946 - 20?? Cities have entertainment! Slab City can entertain you, too! I believe Builder Bill is given credit for this 'range' of fun, fair, and great entertainment on Saturday nights! Volunteer musicians have been 'building bands and making music for years on the stage at "The Range"! It's usually cold at night when the bands play. People gather around the fire barrels, those who may have drank or smoked too much often dance alone in a corner. The dress code is more casual than during the day, but shoes are optional. If you can manage a visit to Slab City in your lifetime, it will be different than any club you've attended under the stars. The audience can be more entertaining than the performers sometimes, and all the canines in Slab City take turns prancing across the stage! MEET THE SLAB CITY DOG GANG! ........ A few of them! Sometimes Angel ran around with her 'twin' or followed the people riding mules down the street! Angel 'gets around'! .......in spite of her owners' efforts to keep her at home. She's a very well 'socialized' dog! Maybe it's time to take a good look at some of the 'slab dogs' we met! The second dog we met was 'Angel'. 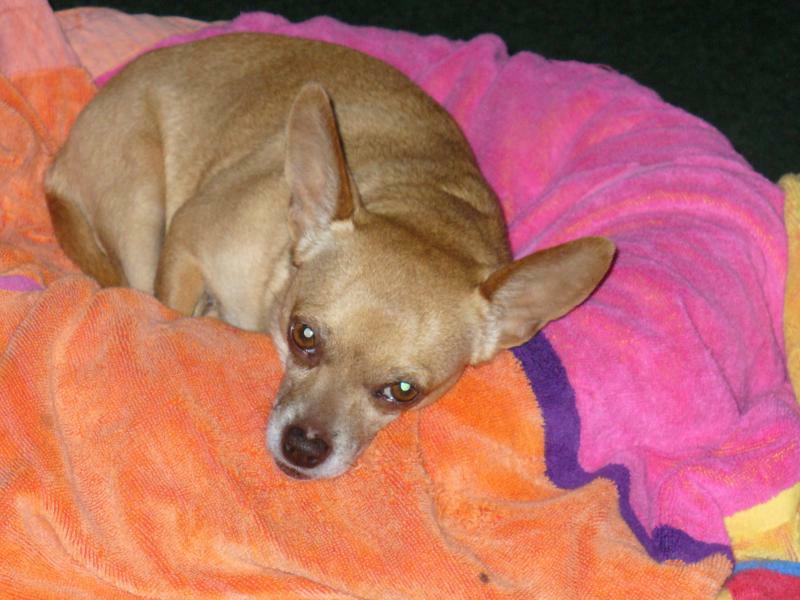 Angel had lost her previous owner, but was quickly adopted by another 'friends of the owner' type of people who already knew "Angel was Special". Everyone had Angel well trained. Seems that Seann even came to Slab City 'armed' with a huge bag of bones! Angel loved everyone, but she knew where to find Seann! Angel also liked my CHAIR! "A Dog's Life"
Angel really DID prefer my 'Texas' chair for snuggling up around the fire after the sun goes down! You'll see Angel in many other photos, too! Obviously life in Slab City is pretty relaxed! Why can't 2 dogs have a good wrestling match on the floor in The Haven?? No one seemed to care, but just watched the immodest pup playing happily. Some were 'guard dogs', but most dogs just needed guarded, so they could stay 'safe', because there could always be an unexpected accident happen to a sweet dog! This lady tried hard to get her dog to cooperate and have his photo taken to be included in this blog, but the dog wasn't too sure of being close to me and my Jeep! We found another beautiful 'actor' for our photo shoot! In general, Slab City dogs understand their role, and take it seriously. It was my impression that they should 'guard the home front' around their owner's camp. Otherwise, they are expected to be sociable, polite, and be peaceful. Then, there are the bird hunters below who bring their dogs to the area to hunt birds, like the one below! The young man had driven to the area from the coast of California to look for some good hunting with his dog. Those who live, love, and treasure their time in Slab City often find it a nice, quiet, and suitable resting place when their beloved dogs cross over the Rainbow Bridge! Here you will see many of those beloved pets who are buried here, still treasured and remembered! It's a peaceful land here, not soon to be congested or disturbed by automation, electronics, or the madness of 'progress'. Instead the pets will only hear the patter of humans coming once again to pay respect to their pet, and the occasional jet plane or bomb 'pop' from the nearby testing grounds! But those sounds won't be anything 'new', ...... just comforting and familiar! Many little angels lie buried here after a life well-loved in Slab City! 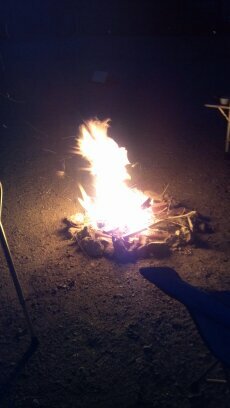 And ........... in the evening, there is a sunset, a campfire, and a big shiny moon! MONDAY with Golfers, Dogs, Cats, and Good Friends! Chili Bob and Seann just left for Costco in El Centro because Pepsi is $0.88 a bottle, and our Canadian boy loves Pepsi! They left out early, driving quite a distance to Costco to stock up on 'goodies' to last a few more days and enable them to live and have fun in Slab City and have all the conveniences they chose! Along came Julie, who had had a 'gold date' with Hiker Mike, the golfer, to play 18 holes today! 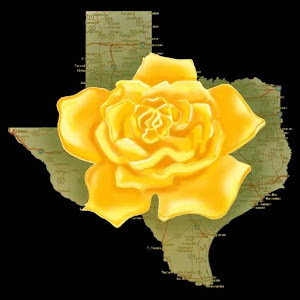 Meet Julie, who was camped with us! She has a nice new rig and travels with her cat! 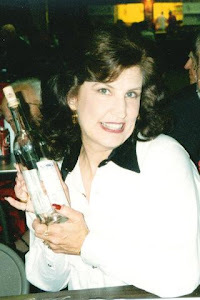 Julie has a passion for writing and the ability to write and travel at the same time. Julie is tons of fun, and has great knowledge about all the toys in the 'techy' world! Meet Hiker Mike who was 'walking' his way from Southern California north! He was a 'hiker', not a hitch-hiker! We had lots of questions for him, and enjoyed his tales about his adventures! Hiker Mike had become a minimalist, with only a bedroll, and a change of clothes. He decided to make the trip without the aid of technology, so he traveled without his cell phone. He claims there was no 'withdrawal' from the world of technology! You'll be amazed when you see the Gold Course where Slab City residents play golf regularly! Karen has started the day with a 'clean all over' and a major decision about whether to wear Capri pants or jeans! It's only 8:00 a.m. here, but that's a big decision when you are on SLAB TIME! We both soon found out that you can't stay 'clean' if you are determined to see everything Slab City has to offer! MEET THE CANINE RESIDENTS OF SLAB CITY! During the past year, I learned of a lady, named "Cookie", who lives in Slab City, ............. a lady with a mission! I already knew from her Internet posts that she loved dogs and ran a 'rescue' shelter there in the desert to keep as many dogs off of 'death row' as possible. She also had recently learned about a friendly, lovable local dog that had been so violently abused by someone that it's leg must be amputated, but the veterinarian's fee was extremely high. The people of Slab City and 'friends' of Slab City have been determined to support 'Cookie' and all of her efforts to care for her rescued dogs and try and provide medical services for the dogs who were in pain or who needed medical attention. Please meet Cookie! Cookie, all of your work is so special. 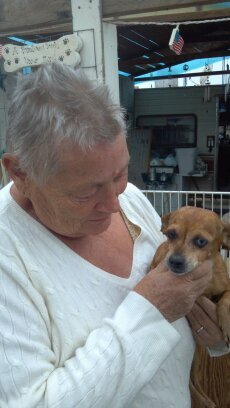 Your love for the dogs you have saved is evident! It's so sweet and gratifying to see how the pups snuggle up to you and feel so loved. Karen and I drove away knowing that there was NO WAY we could leave Slab City without doing a small part to help the pups that Cookie (and supportive hubby, Earl) love and care for so much. Karen and I soon found our way about 40 miles down the road to stock up on dog food for the pups, filling up the back of the jeep, and making a small donation to help build the veterinarian's fund to get the abused dog's leg amputated! We loaded up with dog food to try and be supportive of Cookie and her mission to help 'the helpless'! God Bless you, Cookie! If you want to help Cookie and her rescued dogs, there is a 'chip-in' fund that has raised about 1/3 of the cash needed to amputate the leg of the abused dog. Just contact Bob or Seann, or write me a note, and I will send Cookie's information to you! Many people who live, vacation, or visit Slab City have brought their pets with them. My personal veterinarian insisted that I have an extra supply of medicines for my dogs when they visited Slab City with me last time. He prescribed a medication for them "just in case" they get into a nest of fleas or other insect infestation, gave them their traditional inoculations, and added a 'rattlesnake' anti-venom shot. It was nice not to have to worry so much every time my pups would stick their nose into a scraggly bush, share kisses and play time with other dogs, and 'live' in Slab City without having the 'street smarts' the other dogs have! The first dog you should meet is ''Bunny'', rescued by Chili Bob when he drove "Cookie, the doggies foster mom/rescue lady" into another town to save some puppies! Chili Bob tells the story of how all the dog crates were piled into the back of his car, and one little dog stood as 'sentinental', looking over his shoulder, all the way home. 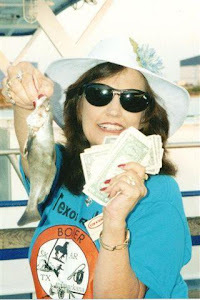 He sensed her presence behind his shoulder, and soon thereafter, ''Bunny'' went to live with Chili Bob forever!! Meet Chili Bob and Bunny!! 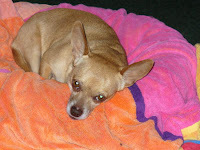 "Bunny" knows who saved her life, she has gained weight, has a new 'vest', and a new mission and a new outlook on life! She protects her master and her territory with a fervor evident only when someone she doesn't know too well enters into Bob's 'territory'! She barely lets him get seated before she has jumped up and firmly planted herself in his lap. She has a purpose now! She has a home, and someone who loves her! 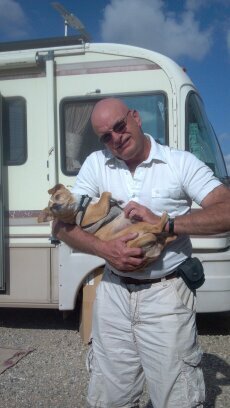 Many people in Slab City probably don't know Bunny's 'starvation to satisfaction' story, and wonder why Bunny only wants her master to hold her and pet her! Such is the challenge! Food won't change her mind, but when you finally gain her trust and confidence, ........ she will let you hold her, or grace you with a brief visit in your lap! Seann got lucky after several months of gaining her trust. On the left is Chili Bob and his adopted angel, "Bunny", who protects him as if she were a grizzly bear with her fast snappy growl. On the right, is one proud "Uncle Seann" who has now gained Bunny's confidence and trust. Not many people could manage get Bunny to sit in their lap or accept a little bit of petting, but Seann has Bunny all relaxed and getting her belly rubbed, ......... in 'angel heaven'! Everyone should give serious consideration to adopting a dog who will always love you once they know they will be safe with you. If you can't adopt a doomed, lonely, scared little puppy, please remember the ones who don't yet have a home, and consider a donation to help with their care. Happy Doggie Days, Bunny!! 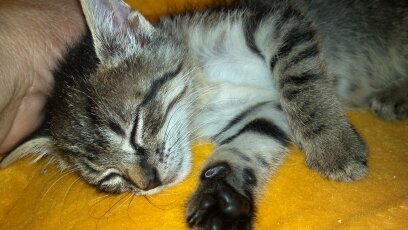 and Tripod, who had been thrown from a car window, breaking her hip and leg. All five dogs now are safe at m house. And I forgot to mention the 9 very wild outdoor kitties who come home every night knowing that I will have 'dinner' set out for them. Traps will be set next week, and after making a deal with my vet, all that can be caught will be neutered or spayed, hopefully to help curb the multitudes of unwanted kittens born each year into a world where their survival rate is extremely low, and their chance of being a tame, loved pet is almost non-existent. The wild ones will be released again after surgery, because, at this stage in their life, living as a domestic cat would be considered almost impossible, but they will always have a good meal in my back yard, and a 'cat house' built for me by my dad, long ago, ..........for as long as they stick around! Please support your favorite non-profit organization that helps our helpless animals. 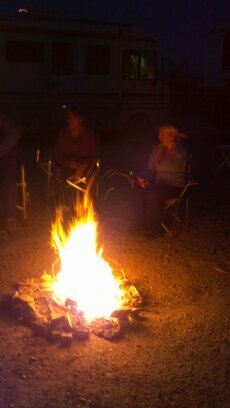 Every day should end with friends around a campfire!! Sleep well in the silence of the desert, be comforted by the cries of the wolves, and look forward to a beautiful sunrise! 'guide' today! His car has 4 doors, and it's easier for everyone when we are 'in and out' often! Everyone has a camera around their neck, so with full bellies, off we go! The very first thing we SEE from our rig is this funny little house the man is building just a few feet from our windshield, and we had an excellent view! He brought a trailer/foundation down from some northern state (Washington?) all the way to Slab City, and is making steady progress to complete his 'home on wheels', and is planning on dragging it all the way back home when he finishes. Someone said his wife gives him money to stay away from home, but I didn't hear that for myself. He often leaves early in the morning and returns late in the afternoon, traveling wherever he finds wood or 'parts' to work on his little house. It looks like it's going to be really heavy! Sometimes he just sits a lawn chair on top and views every one's activities, or else puts a mattress up there. I have a few 'sneaky' photos I will try and find to show you! 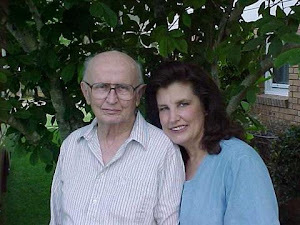 He was a quiet man, and went about his work with determination. It was interesting to see the first lady who approached his house 'project' find a way to get to see inside his house. I wondered what 'words' she knew to get 'entrance'. "house-in-progress". 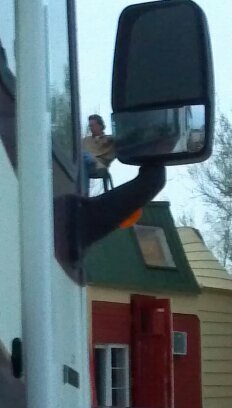 He seemed to enjoy the view from his 'perch' but I felt rather obvious taking photos using the space between my rig & mirror, but once I realized he just didn't seem to mind, I took photos as he arranged his chair and mattress 'up there' for evening viewing. I'm waiting on Bob and Seann to explain how it looks and 'drives'/pulls when he is finished! I felt like a window peeker, peeking out, instead of 'in'! .......More Photos, please! Magee and I slipped away for another lunch at 'that place' where the chicken fried steak was so good, because everyone else had a different agenda! We headed back to town. enter, eat, chat and 'connect' with friends in the small cafe. A mom with a baby in a stroller. A teen with purple hair. ...... a teen not too far removed from television and what's 'hip' in the world of technology. The waitresses were quite accommodating, but were often socially preoccupied, as everyone seemed to know each other when you go 'downtown' Niland! The food was good, and we were ready for adventure when we left! Some of the photos I will post will have been from times we were in the car by our self, or in the car with others! Here are a few of the experiences we had that day! We saw some places in Niland when we toured with Bob, then saw a few more when we did 'girls lunch out'! On our way back out to Slab City, our senses were keen to absorb the experience in broad daylight, so we watched, stopped, looked, and soaked up the quiet little main street in Niland. People quietly went about their daily life as if Slab City didn't even exist out in the desert about 4 miles away. It was comforting to see that Niland has it's yearly traditional festival, and that the people living there were making all the same efforts as people in metropolitan areas to have festivities, nice schools, good playgrounds, and places for people to meet, eat, and greet each other! Niland has 'hysterical' signs to explain what has been there in the past, explaining some of Niland's history and connections with the military. If you have an opportunity, go riding with Bob and hear all of the fascinating stories! I loved seeing the little house with the enclosed yard, trying hard to create their own little oasis in the middle of the desert! When you see that they have gone to the trouble to put up "God Bless America" with paper cups on their fence, it became an obvious reminder that people everywhere we went were planning on celebrating Thanksgiving and making plans to show their appreciation for being able to live in America! children to attend, and a pretty little enclosed playground which was in use as we passed by! I wonder if the children are aware of the people staring at their town and it's amenities. I wonder if the local children are 'aware' of Slab City being so close, and what explanation and 'precautions' they may hear from their parents about the 'people who live in Slab City'. There's so much to see and do in Niland ! Allow a little bit of time to walk the streets and learn what some of the buildings 'used to be'! I do hope you don't have to use the services of the Imperial County Sheriff's Department! MY DASH " 1946 ------------20?? " Biggest Fish and I Won! 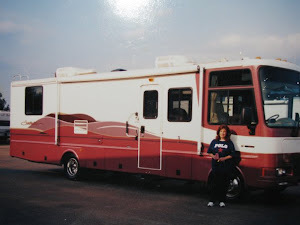 IF YOU ARE SINGLE WITH AN RV, FOLLOW MY LINK BELOW! 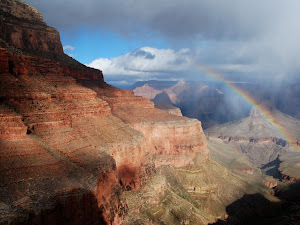 RAINBOWS in "THE GRAND CANYON"
MY LOVE FOR RVing WAS HONESTLY INHERITED ! !